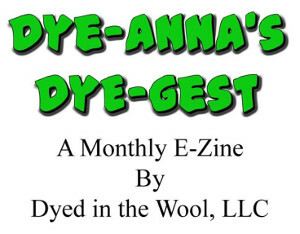 I finally have something to show for the Online Guild’s silk workshop. Our silk sample packs contained so many different types of silk fibers (see "Silk Goody Package, April 21st) that it was difficult to choose where to start. We received 2 samples of of silk brick, A1 and B2. Both are mulberry silk, but the A1 is the best grade while the B2 is the lesser. This yarn was spun from my sample of B2 silk brick. * Fibers catching on rough hands - I found help for this with a hand cream my DD had given me for my birthday awhile back. It is a shea butter, cocoa butter, and glycerin formula by Time & Again. It contains no mineral oil nor petroleum jelly and did wonders for my hands. A "must have" product! * Fly-away fibers - I didn’t have any problems at first, but about halfway through my sample the fine fibers began to stick to everything. I had heard of the silk scarf trick (spinning with a silk scarf in one’s lap) but had no silk scarf! Peg discovered that a polyester scarf worked as well, and I did find that I had one of these. With that on my lap the fibers behaved very nicely. * Runaway twist - IOW, not letting the twist run into the fiber supply. I’m more comfortable spinning shorter fibers so the 4 to 6 inche silk fibers required some concentration on my part. This is largely why I chose to spin the B2 sample first. I wanted plenty of practice before spinning the better quality silk! You can see from the slubs in my yarn that this was indeed a challenge. The trick being, of course, to keep the point of twist firmly pinched. Even so, it is a strong yarn and I am quite happy with it. I confess that this is not the first time I’ve spun silk. When I was a fairly new spinner I was invited to join the Blue Ridge Spinners, a handspinning group which meets monthly at the Folk Art Center in Asheville, NC. They really took me under their wing and provided help, encouragement, and many wonderful fiber experiences, including silk. However, it’s been a long time between then and now! Usually I spin wool and/or angora, so this workshop is a welcome experience for me. More samples to follow soon. The skein is beautifully done. I do hope you spin more to weave something beautiful for yourself. I just started with the B1 too. 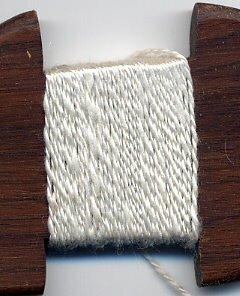 I spun a sample, and wanted to ply it on itself. I wasn't paying enough attention and now have a tangled mass of singles. I will sort them out, but not right now! Your yarn looks really good. I think that I will use both silk brick samples for plying with wool, as I spin to knit.